Would you mind explaining how your products differ from those from Shellawax? It sounds like there are many similarities, such as using a shellac base and applying friction polish and wax. Oldmanwheeler how long are you seeing it take to get the finish you are describing? From the time I've finished turning the pen the entire process should take 25 minutes or so. Of course since the finish is such an important part of the pen making process, I will always take my time and pay attention to every little detail. Perhaps Mike can elaborate on this since I've only been using it a few weeks. There are people that would go for that kind of finish, and if you want to sell what you make, then that is great. However, If you want to sell what others want to buy, then keep your mind open and use the CA, or lacquer, WOP, acrylic or other. My conclusion is that the visual perception determines the tactile "feel" of the pen. A high gloss is perceived as a "plastic" appearance, therefore we will also "feel" it as being a cold hard plastic. A matte finish has the appearance of bare wood, and we will say it has the warmth and "feel" of bare wood, even though it is the identical finish. I admire folks that will develop new ways and methods and I will look forward to seeing some reviews. I love tung oil finishes as well as lacquer (Lived in Japan too long to not like it ) and polys as well. 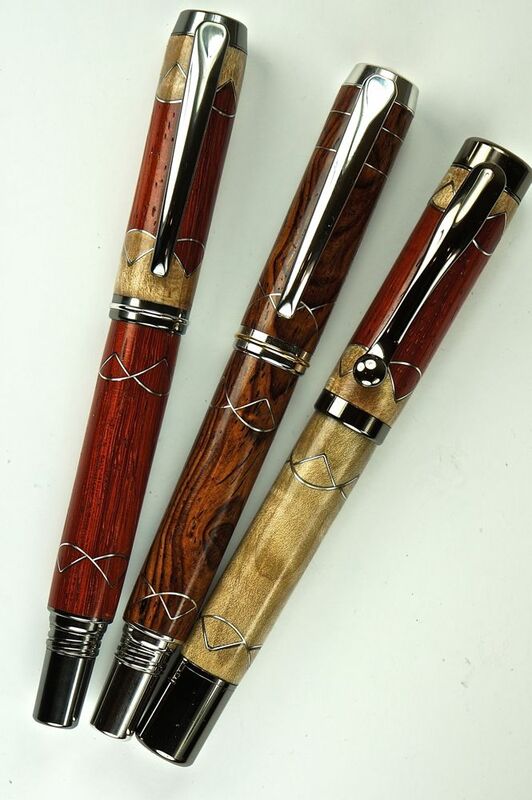 But for pens as a finish, selling the "wood feel" must take into consideration that it will only sell to a very narrow niche market, nor are they always the high dollar sales. Here is the problem: Our heritage use of finishes, waxes and polishes! Before modern day finishes like Polyurethane, or other clear/translucent finishes including certain varnishes, shellacs and lacquers, - polishes, waxes and oils were used to provide protective finishes (on fine wood). So far, so good on this aspect of finishes. However, WOOD finishes as a protectant was cleaned and polished at least weekly, usually every other day and in some cases daily. People with enough wealth to buy fine furniture with oil, wax and polish finishes had servants/miads that cleaned, waxed and polished these items on a REGULAR basis. For people who had fine furniture but did not have servants, before the advent of the working mom/wife, the wife (usually) cleaned and waxed at least weekly. Because most of us on this forum are men, we give no thought to what our moms did (or maids) for upkeep on fine furniture. Instead, we only remember the fine wood feel of polished, waxed, oiled wood. Now to get to pens - Pens are in contact with acidic human oils far more than furniture. And we are not used to the ritual cleaning that went on with the fine furniture that we grew up with. Pens will need far more cleaning than furniture because of the nature of where the pen is stored and how it is used. If that consideration is taken into account and the user is willing to give that kind of daily considerations to the upkeep of the pen, then it should work fine. I noticed that while the maker claims it is different than other finishes, the wood is still wood and as you mentioned the acidic hands will be in touch with the wood. In this case - think of kitchen cabinets that have been well used. Dirt and grime build up on the corners and have to be cleaned. In pens that leave the grain exposed even though properly oiled, waxed, finished, the dirt will still get into the pores and it still will have to be cleaned regularly IMO. I love tung oil finished wood. But on a pen, it would require plenty of cleaning, not to mention what it might do to a white shirt on a hot humid day. I love wood feel and oiled, rubbed, polish of different types, but I sure hate the upkeep. That is what LOML is for, but don't tell her! It is certainly fine that you feel this way. However, your feelings don't invalidate that of others. Many of us have been selling pens with a finish not unlike that described by the OP for years. The fact that our customers come back year after year to make additional purchases tell us that we are doing something right. Further, the pens that I use all day, every day are finished in this manner. After many years of heavy use, I am still happy with their appearance. I apologize for one part, I should have written "and use the CA, or lacquer, WOP, acrylic or other also". This is not a "feeling" (as in my "preferences") for sure. I love the "wood" feel and prefer it on furniture and other wood products. My reply was from reading this forum for the past 6 + years, specifically from those that sell pens in mass market areas and sell what most people want. This very subject of wood versus plastic/CA look has been written about and posted numerous times on this forum over the years, at least once a year! And from the big sellers, several have said that their clientele as a whole prefer the shiny finish. Having lived in Japan for 25 plus years, it sometimes disgusted me to see the frown on people's face as they looked at a hand rubbed, oiled, waxed piece of furniture and asked why I didn't put a "gloss" on it. Not everyone likes "oil" and from reading this forum over the years, the figures come up heavily on the side of "shiny" for the buyers' preferences too. It does happen as you said that some people prefer this and a healthy clientele can be built up. Even a reputation can be built to the point that it draws others in to support the business of Wood Feel finishes. But this is still not the majority of people (buyers) out in the pen world. That is the point of my post. For people who know how to care for an oil and wax finish, this looks like an excellent product. I would have to say that the CA, being an acrylic type of finish would be the most durable, it is a finish that takes some practice to do well. It is also the most expensive of the finishing types. One pro pen turner wrote that he used CA on his high-end pens and other quality finishes on the others. I am new to pen turning and am pretty ignorant on such things, so I'm learning as I go. There are so many finishes and techniques available that it is difficult to decide what you're going to use. Due to all of the praise CA is getting I've been working with that, but I'm not yet completely sold on it. It does take some time to learn. I also hate how it makes turning pieces stick together. There is another guy on this site that uses this method. Here are a few of his. Thanks for the welcome! I'm not quite sure how they would differ. That was kind of my point when I confessed my newbe ignorance in this area. The books I've been reading and videos I've been watching give a lot of praise for the CA method. There was one author that stated that he would have never considered using an adhesive to finish a pen, but is now a big fan of the method. That is why I'm giving it a try. My first three pens I used a sealer and Maylands high build friction polish which was very easy to use. Because I want a gloss finish that would hold up under a lot of handling I decided to try the CA method. It seems to have a greater learning curve, hence the frustration. One time I had to sand the blank back down to bare wood and start the process over. Practice does increase the skill, and I'm also experimenting with the differing methods of application. There seems to be so many different views and methods to the finishing process that trying to decide which is best can be overwhelming. I noticed on the Wood Doctors site that he uses a synthetic wax in the Pen's Plus formula rather than the natural Carnauba in the Walnut Oil/Carnauba and shellac. What method? We've mentioned a few here. These are stunning pens! I really like the inlay. Is that metal?